There have been some interesting recent examples of apparent failure and controversy regarding private provision of public services. G4S and Serco potentially face a fraud inquiry over alleged overcharging on the government’s prisoner tagging contract. NHS Direct’s withdrawal from the 111 phone service has left the future of the service in confusion and some have protested over what is a profitable asset – the East Coast line, being put back out to tender. How should the public and private sectors better interrelate? 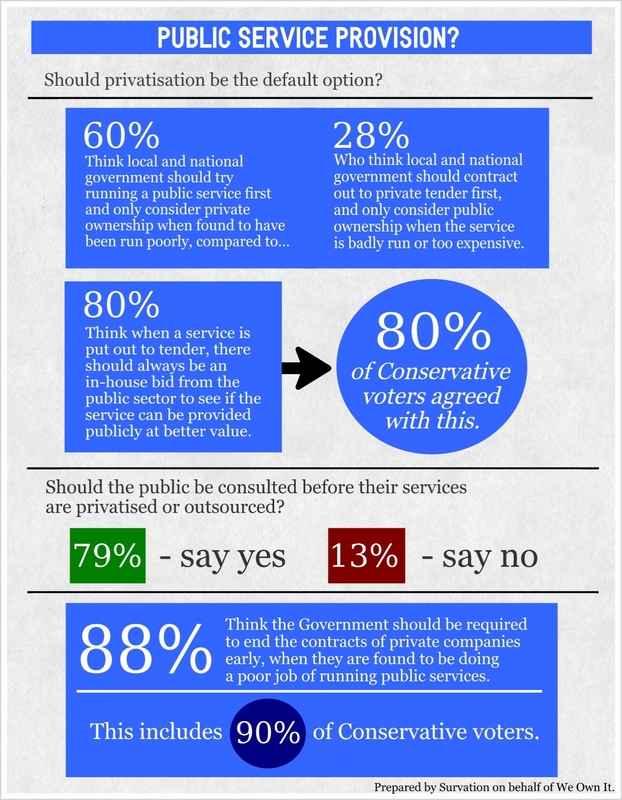 On behalf of We Own It – a new organisation which campaigns for public ownership on behalf of public service users – We asked the public about consultation, accountability, methods of censure and transparency in this survey published today. The report ‘Better in Public Hands’ includes case studies of successful public ownership from East Coast rail to the Parisian water supply and is available from We Own It on request.